After a slate of instances where the various band members made references to Christmas tunes in their solos on non-Christmas songs, here’s an instance of the opposite. On this, the only commercially released recording of the Dave Brubeck Quartet with Paul Desmond playing a Christmas song, Desmond managed to squeeze something else in there, too. Naturally. Columbia Records decided to make a Christmas jazz album comprised of numerous artists on their jazz roster. During recording sessions made from 1959 thru the spring and summer of 1961 and ’62, Columbia’s finest made time to lay a short rendition of a Christmas tune onto tape. Duke Ellington, Paul Horn, Miles Davis, Carmen McRae and others participated in the album. 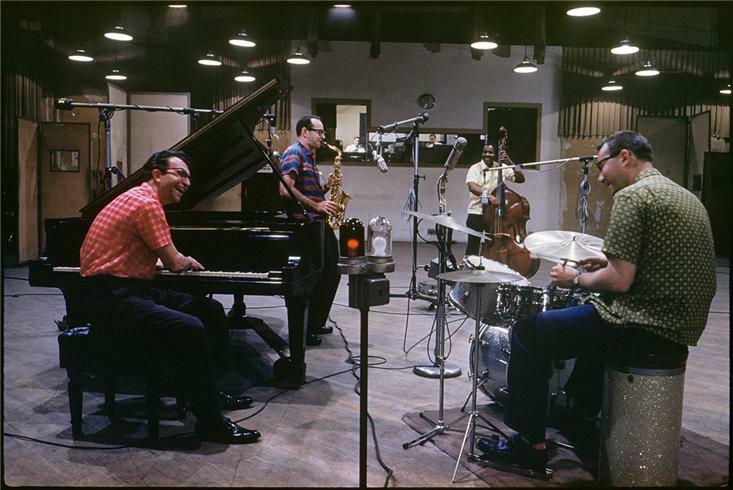 Dave Brubeck was tapped to contribute something as well, and in June of 1961 his quartet chose “Santa Claus Is Coming To Town” as the song to record Based on the numerous instances where Desmond quoted this Christmas tune in other songs throughout the years, this song might have been a favorite and may have been a reason why they recorded it. Due to the tight time constraints likely placed on them, Brubeck’s group doesn’t get much room to stretch out and really blow. Desmond and Brubeck are the only guys who get to solo, and only for a single chorus. Bassist Eugene Wright sticks to a strutting two-the-bar walk for the entire song, giving the proceedings a bit of a bounce. While Desmond states the melody, Brubeck plays “Angels We Have Heard On High” behind him. Desmond’s solo is brief but full of humor and vivaciousness. It’s in the ninth bar of his chorus that Desmond plays a few bars from “Easy Living”. Was he making some hidden and sarcastic reference or was it just a coincidence? Who knows. One could make the case that he was making a veiled jab at the whole ‘watch how you live so you can get stuff when Santa shows up’ message of the song. Brubeck’s solo quickly moves from single notes to thundering chords in no time at all. Desmond sails back in to close the tune and they’re over in two minutes. The song appeared on the 1962 album ‘Jingle Bell Jazz’, an album that, despite it’s numerous reissues on vinyl, hasn’t been released on CD in it’s entirety. I know many hip jazz fans/musicians think Christmas songs are cheesy and corny (in 1962, Los Angeles jazz radio host Frank Evans called this Columbia Christmas effort “one of those hard things”), but I would have loved to hear a Christmas album from the Dave Brubeck Quartet featuring Paul Desmond. Considering Brubeck’s obsession with time signatures, imagine what a “Take Five”-ish version of “We Three Kings” would sound? Oh well. This is the only example of what a Christmas album by Brubeck’s Quartet from the 1960’s would’ve sounded like. After you’ve enjoyed the holiday festivities, check out the track and try and find the quote. Happy holidays, and as Paul Desmond said in this song, I hope the living is easy and the fun is copious! The quote appears at the 1:14-minute mark. Where ever you are in the world, happy holidays! I really like your blog! You always have some great music and makes me broaden my interest. Keep it up.